Do you want a fuller look but without the hassle of applying full make up every day? Eyelash extensions can give you fuller, thicker and darker lashes to enhance your eyes and accentuate your features. Come and book in your own Camden eyelash extension appointment with our critically acclaimed stylist (she’s one of the best in London!). 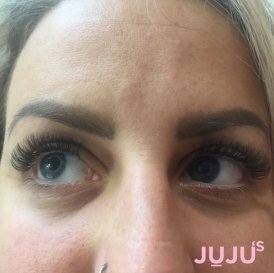 At JUJU’s, our fully trained beauty therapists offer a full consultation before we make any decisions on how to proceed with your eyelash extensions. This friendly face to face allows our award winning stylist to study you and bring together the right treatment, each individual lash bespoke for you. From the information you give us, we ensure that our high quality eyelash extensions are tailored to suit your requirements. Whether it’s lashes that are abundantly thick, or lashes that are more natural and discreet, our extensions are designed to enhance your entire overall image, as well as making your eyes stand out. At our luxury beauty salon, we only use the highest quality adhesive and refuse to lower our exceptionally high standards with poor quality lashes. Every brand that we use at JUJU’s is carefully researched by our team of experienced and professional therapists, so you can rest assured that you’re getting the best products in the industry. Individual eyelash extensions are made from a synthetic material and are flexible, strong and natural looking. Using a medical grade adhesive, the lash extension is adhered to the natural lash to create a look that is darker, fuller and longer. Choose from different levels of curl, length and thickness to fully customise your look and get the eyes to suit your face and lifestyle. As your lashes shed naturally, the individual lash extensions shed too, so there is no painful removal process. When applied properly by a trained beauty therapist, eyelash extensions look just like natural eyelashes. Choose from range of different styles, from natural eyelash extensions to Russian volume lashes, and enjoy a wide eyed look that is thicker, longer and darker – so there is no need for mascara! Typically, extensions will last a duration of 3 to 6 weeks, their lifetime depending on an array of factors, including your own skins and hair growth rate, the outside wear and tear, and of course the quality of our materials and the skill of our eyelash extension expert. As you discuss your lashes with your consultant, choose whether you want the lashes curled or straighter, for a look which suits your face. As your natural lashes fall out, the eyelash extensions shed alongside them. They should however, last for 2-3 weeks at the very least. Eyelash extensions can remain topped up with regular infills. For more information, call JUJU’s beauty salon and speak to one of our professional beauty therapists. If you prefer to keep the lashes, which we are sure you will, regular infills keep the look. 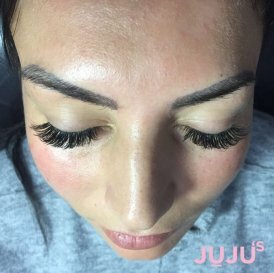 Because our Camden eyelash extension service is very customer focused, you get a unique service that centres around your personal requirements. During your consultation with our eyelash extension artist, you will discuss the look that you want to achieve and we’ll explain exactly how we will achieve it. Because your lash extensions are tailored to suit your face, we’ll look at the shape of your eyes, natural eyelashes and the demands your lifestyle. This is the information we use to put your package together. You can keep eyelashes in for as long as you like, just make sure you look after them and your lashes will last so much longer. There is no damage to your natural lashes either, our trained therapists know how to achieve a wide eyed look, without weighing down the lash. 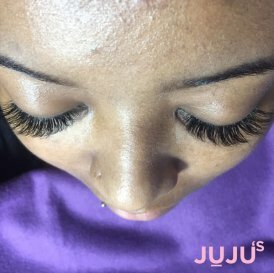 You can view JUJU’s eyelash extension prices for classic lashes, Russian volume lashes, LVL lash lift and infill Russian volume lashes here. To book eyelash extensions in our luxury Camden Salon or to arrange a consultation feel free to contact us! Please call JUJU’s beauty salon on 0207 2678787 and make an appointment. We will take down your information and work with you to find the most suitable time to book in an appointment with our extensions specialist. Please note that we do not infill another eyelash technician work and recommend instead to get a removal and start a fresh set. Please do not wear eye make up to the appointment as this can shorten the length of your treatment. Looking for Other Beauty Treatments With JUJU’s? Our Camden Salon offers all manner of beauty treatments, you can walk out with a far better look than just lusciously beautiful lashes. To get a better idea about the range of services that we offer please visit our treatments page.